In this day and age it's always tempting to take the easy, and usually cheap, way out when you need some new electrical product. So it was I checked out printer prices when mine packed up last week. It was only a cheapish print/scan/copy machine but I needed it replacing urgently for work. Google revealed my local camera shop stocked the one I wanted but it was £15 more than I could get it on-line. However I could have it that day rather than wait, or pay some £7 for next day delivery. The week before the printer packed up I'd bought a couple of ink cartridges as two colours were getting low. I buy them from the camera shop for convenience and because they are reasonably priced. Of course a new, but very similar, printer has new, but similar, ink cartridges. I'd be stuck with two useless plastic containers full of expensive ink. Cheekily, I asked if I could swap my unopened inks for the ones to fit my new machine. To my delight this was accepted. Yay! Taking into account the cost of the cartridges and the next day delivery I would have had to pay for I ended up saving money. Which I always like! Although this is about photographic shopping the same applies to tackle shops. Support local businesses whenever you can - especially independent ones. So by way of a thank you I shall point you to the photographic extravaganza Wilkinson's are holding next month. 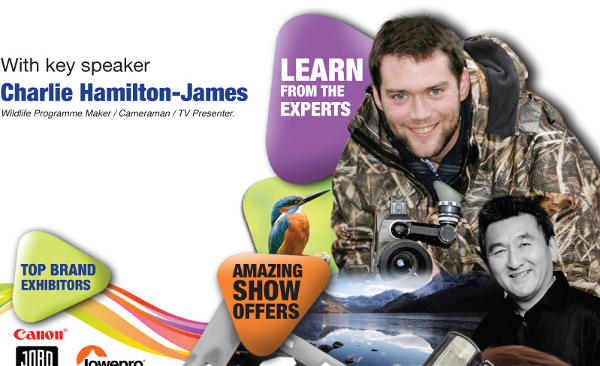 It's a camera show called Digital Splash 2012 with talks and demos being held on Sunday 14th October at UCLAN in Preston. Unfortunately I can't make it as I have a trade show to attend in the Midlands on that day. A shame as I'm sure it will be a great day out.